What are the advantages/disadvantages to having excess beans in the hopper vs just the exact amount? Initially i used to keep all my beans in a vaccu container and only load the amount needed into the grinder. This worked ok but I read somewhere that this makes the grind inconsistent. So last couple of weeks I've loaded the hopper half full. I'm finding that I need to be a lot more precise with loading as I seem to have a little more wastage but its just something I need to adjust too. I'm not sure I'm seeing an increased consistency. I am grinding coarser one notch. Not sure if ths is a coffee batch though. Is there a consensus or a best practice? One argument is the weight of the beans in a fuller hopper helps feed them through for a more consistant grind. The other one is that I don't notice any difference so I only grind what I need to keep the rest of my beans fresher . I do similar--I have a Sunbeam 6910 pressurised basket that I use as a dosing measure, I then dump the double shot dose of beans into the throat of the grinder I then place the basket snugly into the SJ grinder throat to prevent popcorning, when they have finished grinding I pump the basket up and down a couple of times and this helps 'pump' any residual grinds in the chute into my portafilter--works well for me and gives me a consistent dose!! I don't know about a consensus. Is there anything you are having a problem with? The beans will go stale quicker when stored in the hopper. 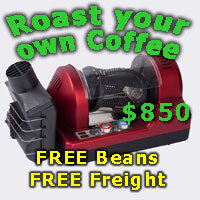 In a busy cafe environment, the beans will probably not be in the hopper long enough to lose much freshness. Currently I use method 1, adding two shot's worth of beans, but I notice that the first shot almost always pours better than the second. My BCG800 produces a much better grind when there are beans in the hopper, noticeable even at the grind I use for aeropress (somewhere between drip and espresso). At least its hopper is slightly opaque. The SJ also gives a better grind with beans in the hopper - I recently changed from just adding enough for one shot to adding a couple of days worth to the hopper and had to open the grind up a good 1.5 notches. The result in the cup didn't change much though, my main reason for keeping beans in the hopper is one of expediency and consistency when making more than one. And where my grinder is situated and with good fresh beans, 1-2 days in the hopper is probably neither here nor there really. Yeah - I just dump the 250g into the hopper. It only lasts a few days. Thanks all. I'm putting 125g of beans t the moment as I use 25 per day on most days (1 double shot 21g in basket). I'll continue this for the next few batches then go back to only the amount required for the hot and see if there is a difference. I am using about 125g above the top of the conical burr and will spoon in additional beans after the morning coffee for my wife and me. I have noticed that using the electronic doser the shot/grind weight will vary more when the Mini hopper is real low on beans. I will Post a link to the setup when I get enough Posts to qualify for a "Link". I thought that the beans would be stale after 24 hours in that case? Here are a few versions of what I did on my Kony-E. I have other versions of the clear tube hopper also. The grey weight inside the tube keeps minimal pressure on the beans (85 grams) and provides an almost air tight seal above the beans. The string on it allows it to be retrieved to load more beans easily. Wow that's some pretty sweet gear BLrdFX! Thank you! I try to put my hobbies into what benefits me the most, and currently coffee gear has my vote for long term, non offending, hobby. I traded one hobby for this one, even though I have been drinking decent coffee and espresso since 1972.